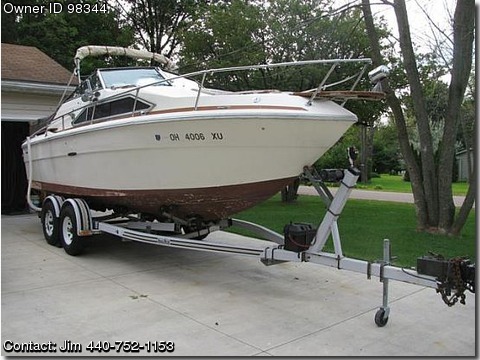 Please contact boat owner Jim at 440-752-1153. Boat is located in Sheffield Lake, OH. Excellent condition. 22 ½ foot with a Single Mercruiser 260 IO 350 Cubic Inch Chevy V8 Dual Batteries, 75 Gallon Fuel, 20 Gallon Fresh Water, New Garmin GPS, FishDepth Finder, New Marine Radio, New Tachometer. Cuddy Cabin with Galley which has a sink, 2-burner stove and ice box, enclosed private head no shower, just toilet with outside pump-out drain, Dinette Table that converts to Sleep Area. Newer Upholstery and adequate lighting throughout cabin, head and deck. Bow Pulpit with Dash Controlled Flood/Spot Light. Deck area seats 7 comfortably and can sleep 3 with the seats easily converted. Bennett Trim Tabs and trim-able out drive. The lower outdrive unit was recently replaced. Recent engine and mechanical work done by a Dealer includes the following new items: fuel pump, fuel filter, carburetor, water separator filter, electronic distributor, plugs, plug wires, all fuel lines, coil, alternator, belts, exhaust gasket, Gimbal Bearing, Complete Bellows Job with Shift Cable, out drive water pump and impeller. Outdrive lift pump and Trim Tab cylinders were rebuilt last year. All dash gauges work and the ignition switch was just replaced. Last year the hull seam was resealed to ensure the watertight integrity of the interior. The boat comes with all Coastguard required safety equipment, life jackets, two anchors spare prop and water skis. Included is a 1989 Load-Rite dual axle trailer with new brake master cylinder and a 4500 pound winch with its own battery on the trailer. The boat loads onto the trailer with the push of a button.